Ireland won the Hong Kong 7s tournament last weekend. IRELAND HAVE BEEN handed a tough draw for the World Rugby Sevens Series tournament in London next month, as Anthony Eddy’s side bid to replicate last year’s exploits at Twickenham. As the invitational team, Ireland — who secured a place as a core team on the World Rugby Sevens Series 2020 last weekend — have been paired with hosts England, New Zealand and Scotland in Pool C.
Eddy’s side created history at the tournament in 2018 when they advanced through to a first-ever World Series semi-final, before beating England to secure a memorable third-place finish. 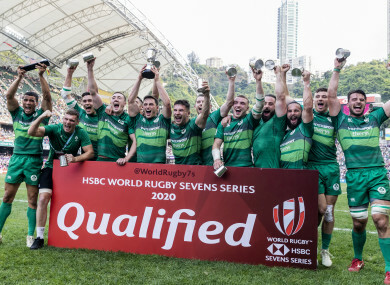 Victory at the Hong Kong 7s qualifying tournament earlier this month means Ireland will become one of the 15 core teams contesting the 10-round world series next year. The London 7s takes place on the weekend of 25/26 May. Email “Ireland handed tough pool draw for next month's London 7s ”. Feedback on “Ireland handed tough pool draw for next month's London 7s ”.